MANUFACTURED FOR A PRICE CONSCIOUS MARKET. WE EXCEL IN THE SERVICE AND SUPPORT OF OUR DISTRIBUTORS. WE CUSTOMIZE PRODUCTS TO SUIT YOUR NEEDS. GIVEN US A CLEAR EDGE IN PRODUCT DEVELOPMENT. 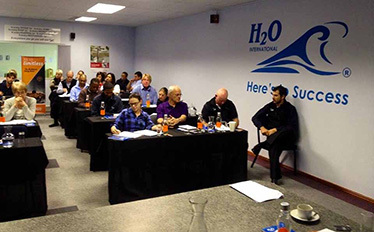 H2O International is a leading manufacturer of POU/POE water filtration systems using GAC and KDF media. Our systems enable you to provide your clients with a high-quality product at an affordable price. Our filters come in a variety of capacities and designs for the point-of-entry (POE) and the point-of-use (POU) countertop, undersink, showerhead, dispensers and whole-house units. Your priority is to sell your products and services to your clients. Dealing with faulty products and returned items costs you time and money. Our responsive representatives will assist you with orders and our technical specialists will answer your questions about products. Two decades of research and experience have given us a clear edge in product development. The result is a full range of systems with high-grade components that are NSF certified. Water cannot be judged by its appearance alone. The same can be said about water filtration companies.